Today I spent about 2 hours on the lighthouse drawing, almost forgetting that it’s Thursday and needed to get my time in for this piece. Sodus Point Lighthouse, a graphite drawing (9×12) is being drawing on Strathmore Bristol Vellum paper. Graphite is being used for the entire drawing because of its reflective qualities. Nearly 100% of today’s time was spent working on the foreground water, a few outlining rocks and a very rough outline of the pier. For the foreground water I used graphite pencils 2H, HB, B and 2B – bringing in a kneaded eraser to begin capturing the foam trails. If you recall last week’s foreground water was a bit weak in value, this week cross-hatching strokes were used to blend in the strokes and begin adding depth to the area. A tortilium was used as well for blending. Moving forward I’ll begin working on the foam sprays, pier and continuing to draw the characteristics of the turbulent water too. Incredible to think that there is such turbulence in one of the Great Lakes (Ontario), but the lake is large and depth enough. Thanks for checking in and have a wonderful weekend. Click onto the image for a larger view (image is a bit little blurry today, sorry about that). Mary this is a beautiful piece, and I can’t wait to see your finished presentation. It amazes me how much you accomplish every day. You’re truly an inspiration! Hi Elisa, thanks very much. This particular piece is a great reminder of where I grew up, the lighthouse inspires me to bring it to life on a 2-dimensional space. You’ve made my day, thank you for being so generous with your comments. It is coming along beautifully, Mary. Thank you, it’s getting to be a longer process on this scene than what I anticipated. But that’s okay, it has been fun working out the water. You give wonderful motion to the water – I can almost feel it!! Thanks Christy – what a beautiful comment and compliment! Thank you Poppy – I’m so glad you are enjoying this scene. Perhaps next week a bit of drama will develop. Have a wonderful weekend. 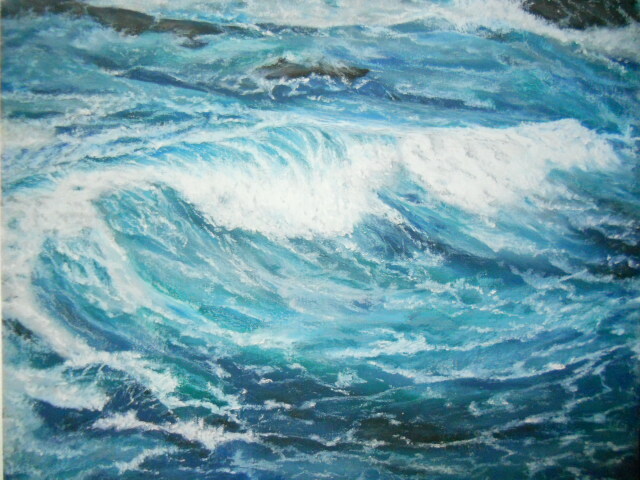 Beautiful water technique, love it every time you draw water, is so magical to watch the progress and see the direction where you take a plain white canvass! Thanks Eva – loved reading your thoughts and feedback on this piece. There is something about the cloud bank that is bothering me, so I do see some changes that I think are going to come about in that area. Having a ball letting the water have its way as I find patterns left behind – hope you have a wonderful weekend too my friend! Love it “having a ball letting the water have it’s way” now that is a super contagious line, we should as artist always have that “ball”. Thank you Mary, you made my day, sorry evening! And today I let the garden have its way (so to speak) – after painting #15 the rest of the day was working in the yard. I’m bushed, a good tired though. Have a beautiful weekend too Eva ~ take care, sending thoughts your way. Hi Cha! Thank you so much – have a great weekend! So wonderful to see the progress, Mary! Watching your progress from week to week feels like I’m in on a secret, Mary. Looks great!! Thanks Geralyn for your feedback – my Thursdays drawing is always a work in progress, showing the steps and creating a pictorial of the scene. Hi Miss Cat! So great to see you and hope you new blog is going well. Thanks so much for your beautiful comment! Have a wonderful weekend. Ah ha … based on a Great Lakes lighthouse … as always, interesting to watch the progression. Thanks Frank – Lake Ontario is really a beautiful body of water. Hi Jet, thanks very much. Oh yes I understand about the water action – Lake Ontario (in upper NY State) is very large, 60 miles across and when strong winds come down from Canada across the Lake they really stir things up. That’s incredible, Mary! You’re doing a fabulous job. 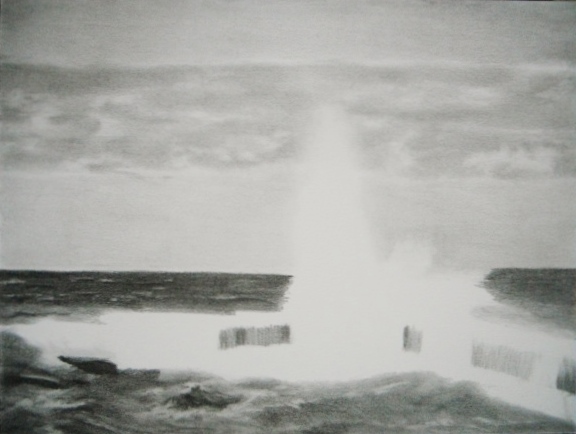 Thanks Jill – drawing water with graphite, I just love it and get a real sense of gratification from it. Have a great weekend! Thank you Dorann, hope to pull it off – love surprises!